As often, I come late to the party (in real life, I’m very, very punctual, in case you’re wondering), and I’m getting all glowy and excited while everyone is already close to the hangover. Yet, I still feel the need to write this post (adding to Goodreads’ 4000+ reviews already) because I loved the book and there might be some late-comers out there who still need some convincing, and particularly from someone who never, ever listens to all the hype (to a fault, evidently). Yes, it’s a love story and a war story, but it takes unusual twists and turns. It addresses some themes I’d never heard about in this genre, like casual British racism against Blacks, addiction to morphine, the siege of Malta (where British soldiers couldn’t really fight back). It’s also unusual because of the fate of the characters (I won’t spoil anything) and because the book ends in 1942, very far from the victory. The book makes you see what the London Blitz felt like (and very vividly so), but not only. In fact, I would argue that this book is just great in all 4 key areas that are used to enter a story (*Kazen’s framework in my mind): language, characters, plot and setting. Not one is larger than the others, I’d say, and it’s quite rare to find such a good balance. As the train came in to the platform they took their bags from the rack and disembarked. They embraced, and Hilda dissolved into steam. Once she was gone, Mary leaned into a corner for a while. No one interrupted her. Half the city wept into walls now. When Alastair looked up, he was surprised to find the war. She had done it again, her trick of making it all disappear. 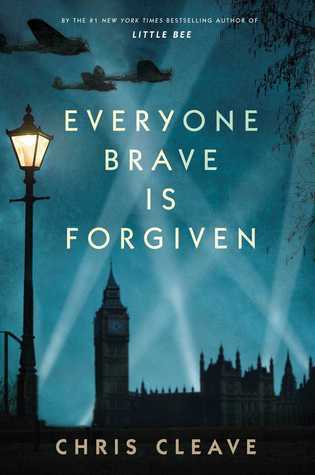 That’s what Cleave achieves in a nutshell: all the while I was reading, I was in London during the Blitz or in Malta during the German siege, but when I stopped, I was surprised to be back in my bedroom. Well I haven’t read this yet but I have you say your post has me thinking that I should! I’m going to take a bet and say you’ll like it!